The Nightlight Movie is the recently released, first person perspective feature film by the writing and directing team behind Bluebox Limited, Bryan Woods and Scott Beck. Although the two have been working together for over ten years, this is their first feature length film. Both creators expressed in their recent interview with Wicked Horror that they have always been fans of the genre. They appreciate horror’s unique ability to act as a vehicle for filmmakers to express things which may not be possible in other types of films. Although the movie is shot from a first person perspective, Woods and Beck hope that viewers are able to appreciate the depth they intended to bring to the picture via the storyline, characters, and underlying themes rather than dismiss it as “just another found footage movie”. They hope that horror fans see this as a film that takes a different direction than those first person horror films we have grown accustomed to. Nightlight begins with a vlog entry by a teenage boy named Ethan, played by Kyle Fain. He describes a suicide attempt, and mentions how the kindness of a female friend helped him during a difficult time. He mentions wanting to take her to a dance at school, and expresses that he believes his life will take a turn for the better after the dance takes place. The video is lower quality and looks as though it was shot with a laptop or other device with a low resolution, which doesn’t feel like much of a deviation from the usual found footage movie elements. Due to the way the feature begins, the shift to Robin (Shelby Young) is somewhat jarring. The movie immediately transitions from that grainy self-shot video to a different perspective. Rather than recording herself as she prepares to go into Covington woods with her classmates, Robin is simply handling the flashlight she intends to take with her. The audience watches her from the perspective of that flashlight. Although it is strange at first, it makes much more sense that she and other characters would simply be carrying a flashlight or sitting it down, rather than the conventional first person perspective which would require them to be vainly discussing their plans into a camera while alone and then continuing to record as they inevitably become more and more frightened. The filmmakers aspired to do something different with their movie, and in that I believe they succeeded. The effect isn’t necessarily revolutionary by any means, but it is an interesting way to get the feeling of being inside the eyes of the character without requiring low quality or low resolution imagery. The basic premise of the film is that Ethan is dead. He committed suicide in the woods where the group has decided to play flashlight games. It is revealed that many individuals have chosen to end their lives in the very same Covington woods, and Chris (played by Carter Jenkins) even goes so far as to share some of the local legends associated with the forest. The rules he rattles off sound like standard ghost story fare; it features items like “don’t write your name in the woods” and “don’t go into the abandoned church” which sound fairly ominous when shared by a classmate in the dark. The scenario becomes much more alarming when items from the local lore he shares begin to come true. The movie is dark in a variety of ways from the literal to the figurative. If you’ve seen the trailer, then you have a good idea of what to expect from a cinematic perspective. The film takes place at night when the only source of light is a flashlight, and there are underlying dark themes about death and feeling isolated from the “in” crowd. The themes of death and social displacement permeate the movie and give it a dismal, melancholy tone. With that being said, the film does have a few shortcomings outside of this attempt at depth. Like many recent horror releases, the majority of the frightening moments in this feature are based on jump scares. 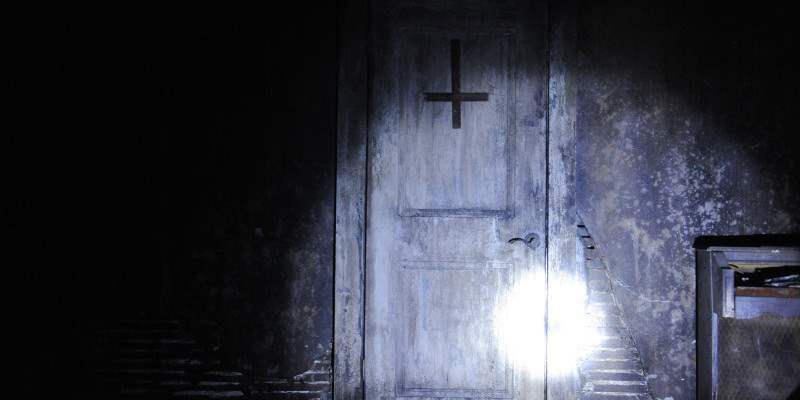 Glimpses of spooky things appear in corners or on center stage for brief moments before the camera shifts focus as the characters run or look away. Although scenes which make us jump are effective in the moment, they aren’t the types of sequences that withstand the test of time for most horror fans. It is true that these filmmakers had lofty intentions for the concept of their first feature; they attempted to tap into some relevant social issues, however they lacked a few vital storytelling elements which might have merited a higher rating. Although Nightlight was visually stunning and the effects were excellent, it lacked sufficient backing. As an example, the acting was decent and believable, but the characters themselves lacked any real or redeeming qualities. They felt less like real people, and more like caricatures of people, or stand ins. Remorse was only expressed by the guilty when it became clear that expressing regret was the last chance for survival. This lack of detail prevents the viewer from become actively concerned about the fate of any of the characters, which keeps the audience from becoming too invested in the storyline. Chloe Bridges played Nia, the standard bitchy popular girl who is interested in the token attractive boy. Young’s character, Robin, is the awkward teenage girl who just wants the attractive boy to notice her and the popular girls to leave her alone. Ben, played by Mitch Hewer, is the token attractive boy who is interested in Robin despite her lack of popularity. Finally, Jenkins’ character, Chris, plays the comic relief and Ben’s would be sidekick while Taylor Murphy plays Amelia, the popular girl’s blonde accomplice. In addition to a lack of character development, there were many eerie scenes but nothing about the movie really sticks out as thought provoking or particularly scary. This isn’t the sort of movie that will prompt viewers to glance over their shoulders when they leave the theater or double check the lock on their door before bed, even if they watch it at night. This is also not the kind of picture that prompts serious discussion or a movement within the horror genre towards a revolutionary technique or approach. It is a movie that tried something new with first person filming that was effective, but that is all it really contributes to the genre. Nightlight had a limited release and made its bow on VOD March 27, 2015–so it should be relatively easy to locate if you’re so inclined. I do think that it’s a film that horror fans will likely enjoy if they watch it once, but it isn’t by any means a must see or must own for your personal collection. After watching it once, you will have likely had your fill. Please take note, I do recommend watching Nightlight once if you enjoy jump scares and would like to see a new direction in first person filming.